Toasters, like just about every piece of 31st century technology, are robotic and possess an internal power source. 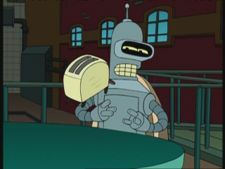 Toasters appear to be lower intelligence robots and unlike more advanced robots like bending units or garbage disposals they lack the ability to speak English, instead sounding more like a dog. 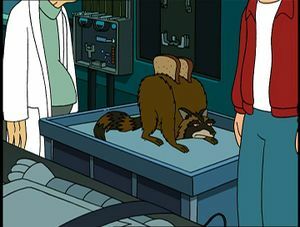 Farnsworth has experimented with toasters on more than one occassion, once giving a toaster emotion, turning one into a raccoon in a what-if scenario and modelling a resurrection device on one. Interestingly, every time a toaster does something of note, it is a different colour. This suggests, with the possible exception of the raccoon toaster, that the Planet Express crew replaces them often. Farnsworth: Good news, everyone! I've taught the toaster to feel love. Fry: [After eating the Raccoon's toast.] Hmm, kinda gamey. This page was last edited on 1 June 2012, at 15:56.